2011 has flashed by in almost a heartbeat. The year passed, has been filled with joyous moments watching my baby girl become a toddler. Her spirit captures me every moment we spend together. Here’s welcoming 2012 and many more adventures. In a medium sized bowl whisk together the flour, cornstarch and salt.In another bowl beat the butter and sugar until creamy and smooth. Add the vanilla extract and then the flour mixture and beat just until incorporated. Cool in refrigerator till firm. 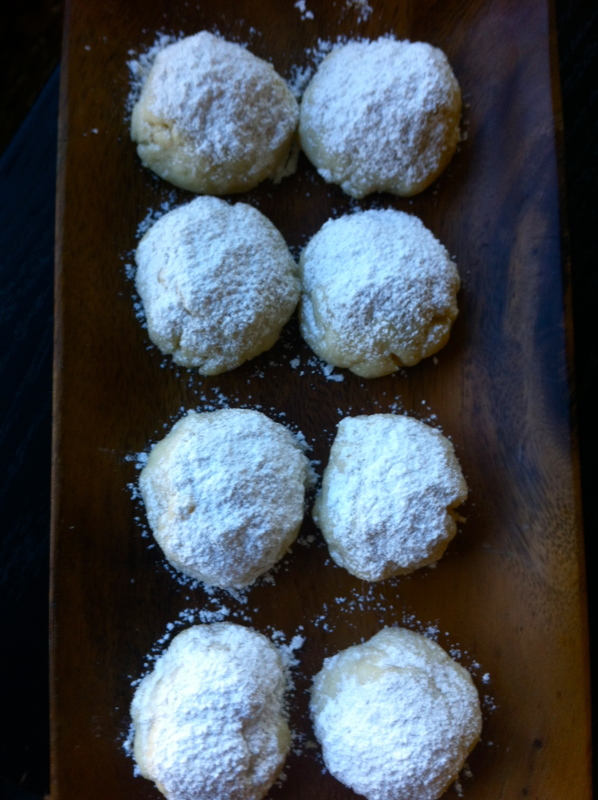 When batter is firm, form into 1 inch balls and place the cookies on the baking sheet, spacing about 1 inch apart. Bake for about 10 – 14 minutes or until the edges of the cookies just start to brown. Take extra care here as they do brown rather quickly. Remove from oven. 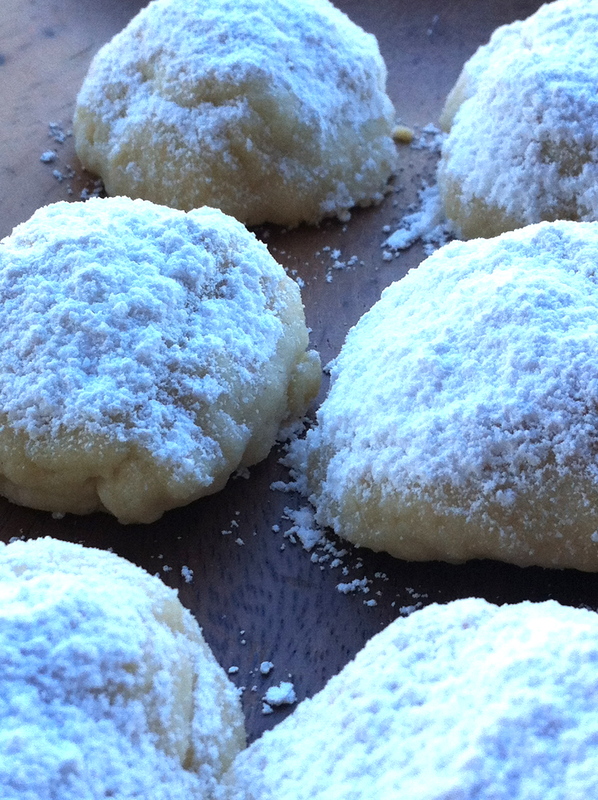 Put the powderedsugar in a fine strainer and sprinkle the tops of the cookies with the sugar. Sift together the flour, baking powder, salt, and espresso powder. Melt the chocolate and butter in in the microwave, stirring until smooth. Preheat oven to 350-degrees F (177-degrees C) and place rack in center of the oven. Drop batter by 1/4 cupfuls onto prepared cookie sheets, spacing evenly. . Bake cookies 8- 9 minutes. Do not over-bake. They will be chewy and incredibly divine! A few years ago, we vacationed at Halfmoon Bay, BC. I had my first nanaimo bar that summer and that cookie is one of B.C’s best kept secrets. It’s a wonderful marriage of graham cracker crust with chocolate and coconut, all held together with some custard. 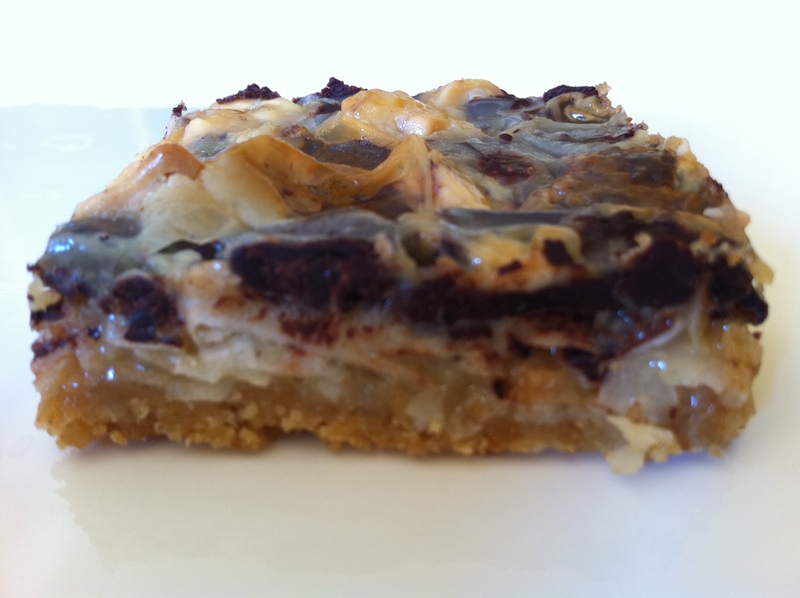 Since I had no plans to make homemade custard, I found a variation of a nanaimo bar – a magic bar! 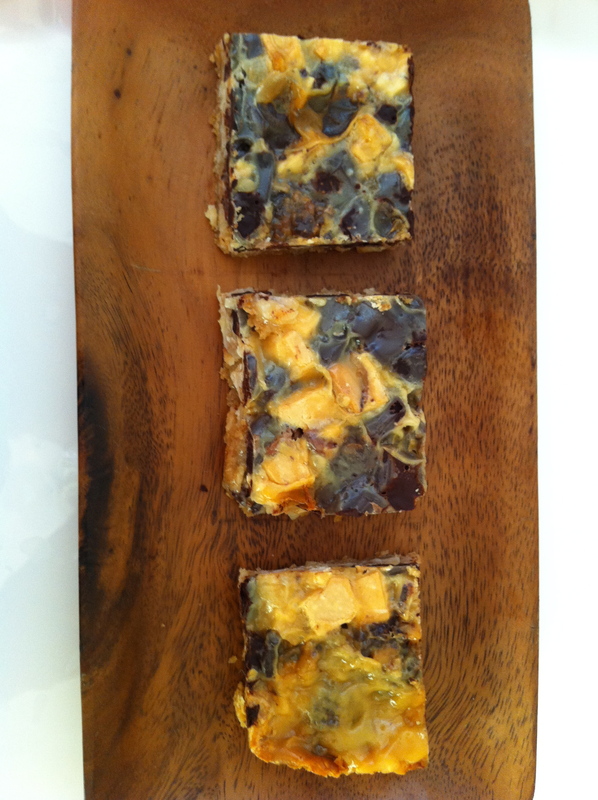 This bar also has a graham cookie crust with a rich buttery taste. It’s supposed to be a 7 layer bar, but I skipped a few layers. The original recipe can be found here. Prepare a square baking dish with parchment paper or coat the insides with some butter. Preheat the oven to 350 F. Spread the coconut in a single layer on a baking sheet and place in oven. Bake till the edges are a light golden brown. This will not take longer than 3-5 minutes and may even be quicker so keep checking. Coconut tends to burn quickly. Next, crush the graham crackers coarsely. Melt butter. Combine the melted butter and the graham crackers together. Press the crumbs evenly onto the bottom of the prepared pan. Layer the coconut over the crust, followed by white chocolate chips and then the semi sweet chocolate chips. Pour the condensed milk evenly over the chocolately goodness. Bake in the oven for 25 minutes. The condensed milk will be golden, the chips melted and you should be able to smell the coconut…. Cool for 30 minutes. I actually placed it in the fridge for 30 minutes before cutting. Its super hot here and the bar was too sticky without placing in the fridge. Enjoy, – made about 12 bars. Preheat the oven to 350F, with racks placed in the middle. Line two baking sheets with unbleached parchment paper and set aside. In a medium bowl combine the oats, flour, wheat bran, baking soda, baking powder, and salt. Set aside. Either by hand, or using an electric mixer, cream the butter until light and fluffy. Beat in sugar for 3+ minutes, scraping down sides a few times along the way. Incorporate the eggs one at a time, then the vanilla – scraping the sides of the bowl another time or two. Add the dry mixture, and stir until everything barely comes together. Then stir in the chocolate, mixing until it is evenly distributed throughout the dough. Use a 1/4 cup measuring cup, to make uniform dough balls. Arrange each cookie at least 3-inches apart on the prepared baking sheet. They’ll flatten out quite a bit. For extra crisp cookies, bake until deeply, deeply golden on the bottom, about 15+ minutes. For Chewy Cookies Cook for about 13 min. Rotate the pans once about 2/3 the way through baking – back to front, top to bottom. Cool on a rack. Makes about 2 dozen large cookies.